How to delete an Alert? How to activate a paused Alert? How to pause an active Alert? In the following example, we look at how to create a single condition alert to notify us the next time the price crosses above the 50 day Moving Average. In this example, we have a 50 period Moving Average overlayed on a 1 day candle price chart. You are now ready to start creating your alert. 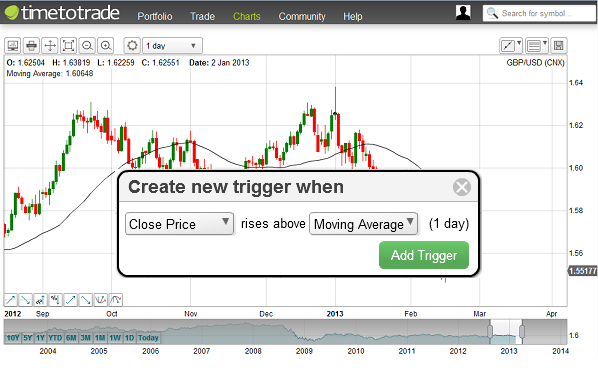 Select your trigger condition by clicking on the appropriate alert trigger button. 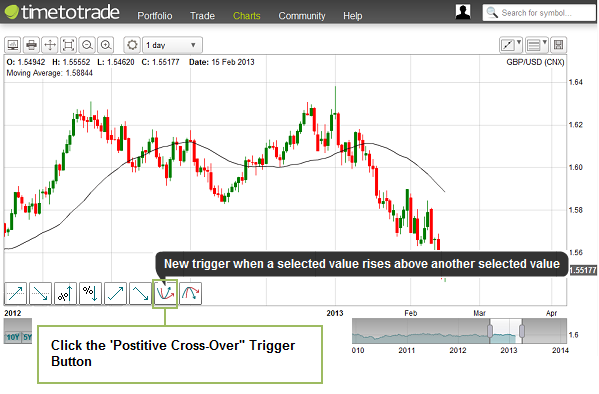 In this example, we are creating an alert to notify us when the Price rises above the Moving Average, and so we will click on the "positive cross-over trigger" button - represented on the button graphic as a blue line rising above a red line. (To help you identify the appropriate trigger button to click when you are creating your alerts, a brief description of the trigger conditions appears as you hover your mouse cursor over each trigger button - to remind you what the trigger button's function is). When you click on a Trigger Button, this opens the "Create New Trigger ..." pop-out box. From here you can select from the drop downs which Price (choose from open, high, low or close) and indicators you wish to be notified crossed. 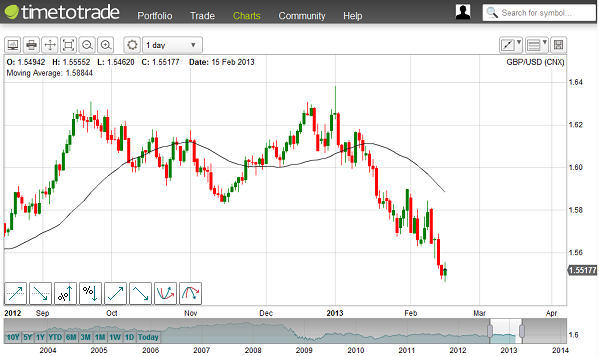 In this example we select to be notified when the candle close price rises above the Moving Average. When you have selected from the drop downs, click the 'Add Trigger' button. The final stage in creating your alert is to activate it. Before you do so, you can customise your alert further. 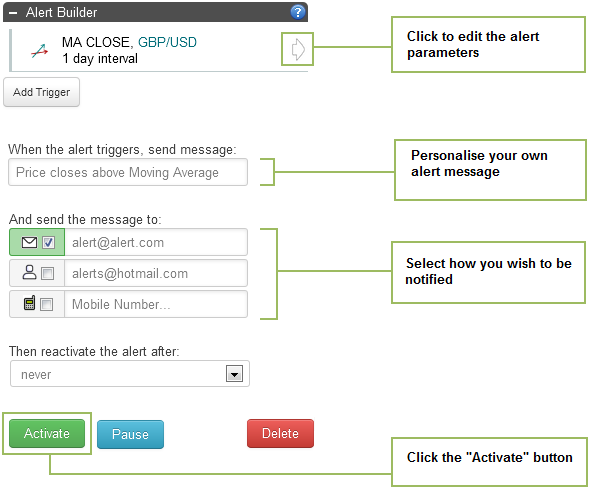 For example you can add your own personal message to the alert. This message will be displayed in the subject header of your email or text notification you receive when the alert is triggered. 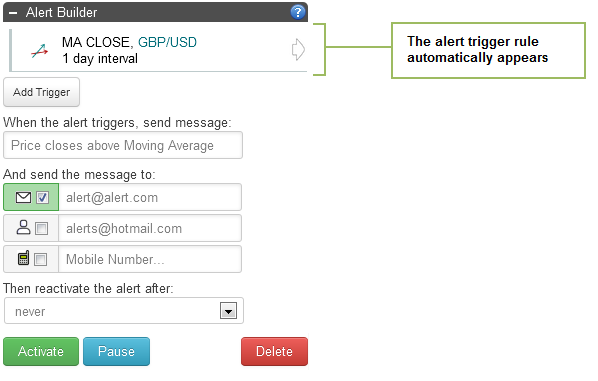 To add a personalised message to your alert, just type your message in the "Message" text box, as illustrated below. You can also select how you wish to be notified: by sms text message or email. And finally, you need to activate your alert. To do so, click on the green "Activate" button, as shown above. 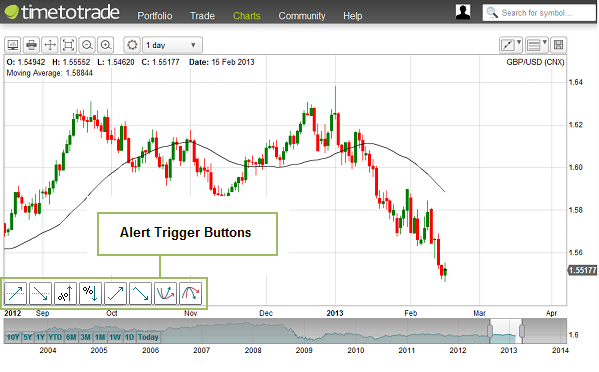 The next time the chart conditions are met you will receive an alert to your mobile or email, as you selected. In the next tutorial we will look at how you can add additional rules to your alert, to create a Multi-Condition alert.